Let It Die is a freemium Sony exclusive. Described as a “super action game,” it is, on the surface, a fairly straightforward hack-and-slash adventure. Then things get a bit, well, weird. Luckily for you, a skateboarding skeleton in 3-D glasses who enthusiastically refers to you as senpai is willing to show you the ropes. Uncle Death, by the way, is pretty much Grim Fandango’s Manny Calavera—if Manny never caught the Number Nine and ended up in a desperate attempt to relive some alternative youth in the throws of a permanent acid flashback. You are you, in an arcade called Hated Arcade, forced to play a game called Let It Die for the Death Drive 128 console. The in-game game is where the real gameplay is, with the goal of climbing the Tower of Barbs formed by a catastrophic event known as “Earth Rage” in 2026. The player takes control of reanimated cadavers called Fighters as they attempt to fight their way through hordes of adversaries to the top of the tower, along the way racking up experience, collecting new gear, and learning new moves. Here is where things get, from a gameplay perspective, far more interesting. The avatars you choose, the Fighters, are meant to be utterly disposable. This approach can take some getting used to, since most current games focus on long-term strategy for leveling and building your avatar. The first time you lose a Fighter—and it will probably be to something absurd, such as accidentally eating the wrong sort of mushroom and vomiting to death, or blowing yourself up, or attempting to dropkick an enemy, falling on your face, and rendering yourself helpless—it feels like a gut punch. You’ve been through so much together! But dying is something you do a lot of in Let It Die, and it is as it should be. “Super action” is an accurate descriptor; this is a fast-paced, brutal, no-holds-barred game. The starting selection of Fighters is level capped to low levels, rendering them absolutely useless for higher floors of the tower. Gaining experience and gear is super fast and fluid. There is a large and amusing array of items to assist you in your venture to the top: armor and fancy hats, weapons galore (in which you can specialize and earn bonuses for use), blueprints and materials to make your own gear, creatures to consume, mushrooms that help or hurt or maybe do both, bumper stickers for your fighters for stat boosts, and on and on. There is also a multiplayer mechanic, in which you can talk to a terrifying Americana-style robot and take a train to raid the lobbies of other players’ towers. This means, of course, that your tower lobby can also be raided. If you don’t want your spoils snatched, you can assign some of your Fighters to stand guard. While this may seem somewhat basic, there is a room for a lot of strategy and skill. And at the end of the day, that is what makes Let It Die so fun. The fast and unforgiving gameplay encourages constant re-evaluation of your play style and keeps it from feeling stagnant. And where the formula of “Kill stuff, advance, kill more stuff” is nothing to write home about, the bizarre humor and really fantastic gameplay make this a must-play game. The over-the-top violence is absurdly comical, and the self-awareness, metagaming, and constant knocking on the fourth wall are refreshing. Also? Akira Yamaoka (of the Silent Hill series) does the soundtrack. Goretastic! As with all freemium games, there is a microtransaction component in Let It Die. You can pay real-world money for benefits such as increased inventory space and Death Metals, which can be used to pay an insurance broker to revive your Fighter (and can also be earned in game). Paying for anything is entirely optional, and you can enjoy the game fully without contributing a single real dollar. 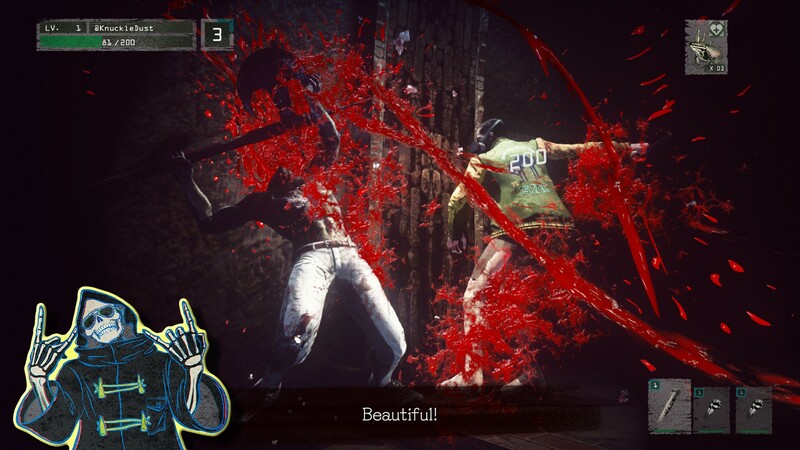 Let It Die, however, is so good and so well done it seems to be a common consensus that players are using microtrasactions not because they need the boosts, but because they want to support the game and its developers. This is important. 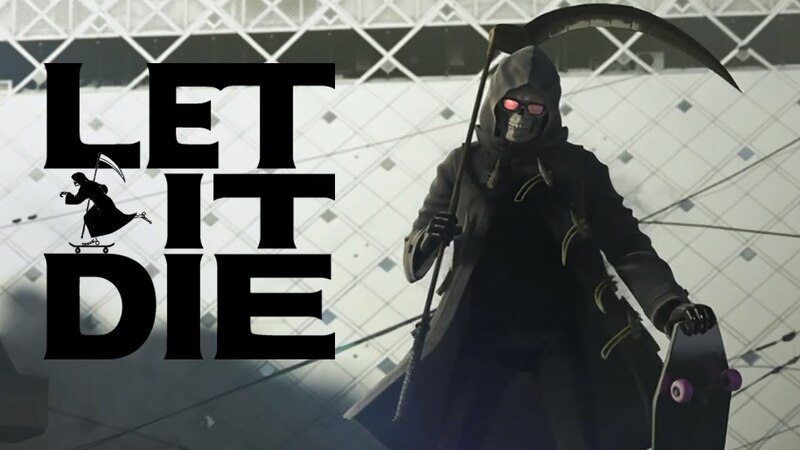 Uncle Death says that Let It Die for the Death Drive 128 is “probably the best game ever.” While it may not live up to that claim, it may very well be the best free game ever. Let It Die’s mantra is clearly to take nothing seriously. And in a world that feels like it is on fire with an all-too-real Earth Rage incident on the very near horizon, this is a sentiment we should consider—even if it’s only for a few hours, as we suplex our way to to the top of the proverbial tower to meet our own demise.